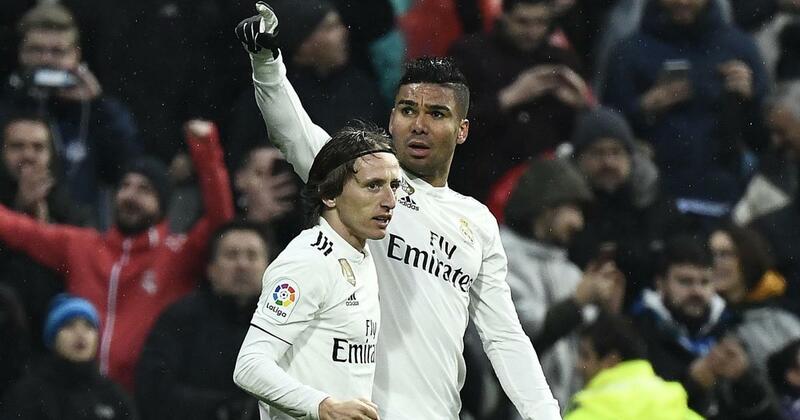 A sensational, strike from Casemiro and a late Luka Modric goal powered Real Madrid to a 2-0 victory over Sevilla on a soggy Saturday afternoon at the Estadio Santiago Bernabeu in Madrid. These two teams usually produce plenty of goal-scoring fireworks, but on this day a solid, strong Sevilla defence amid rainy conditions made for a tough encounter in the Spanish capital. It had to take something special to unlock the Andalusians’ back line and that’s what Casemiro produced with his hammer-blow in the 78th minute. Modric then put the three points on ice with a late steal and a fine finish in what was one of Real’s best matches in the Santiago Solari era. Just like in last week’s affair in Seville against Betis, Solari once again left Isco and Marcelo on the bench with Lucas Vazquez and Sergio Reguilon the preferred starters, while Karim Benzema was back up top less than a week after fracturing his pinky finger. Real started nicely and Vinicius had a good, early crack at goal thanks to some nice work from Modric, but the Brazilian fired right at Sevilla goalkeeper Tomas Vaclik. It took some time but Sevilla started to stitch together some chances of their own and a blistering counter-attack led by Wissam Ben Yedder should have ended with a goal, but Sergio Escudero screwed a shot wide against onrushing Real goalkeeper Thibaut Courtois. A brutal clashing of heads between Modric and Mudo Vazquez left both players bandaged, summing up a feisty and physically first-half that ended goalless. In the second half, the entire match was being played in the Sevilla half and the Andalusians visitors were being pushed back by Real’s incessant pressure, however the lack of a cutting edge in the final third that plagued Real in the first half was manifesting itself again in the second stanza. A blistering right-footer from Dani Ceballos midway through the half almost broke open the dam, but the whistling effort struck the crossbar. Later on, Casemiro came close to unlocking the Sevilla defence after a nicely lofted pass from Reguilon, but the header landed wide of Vaclik’s post. It wasn’t until the final quarter-hour that Solari made his first change, bringing on Isco for the ineffective Lucas Vazquez, but any late minute angst was put to sleep with an absolute bullet from Casemiro. The Brazilian collected a ball outside the area and unleashed a stinging, curling effort that grazed off the fingertips of Vaclik and the lower part of the crossbar before rippling the net for a 1-0 Real lead. With the goal, Real could play with less urgency and more to their liking, with Sevilla posing little threat. Modric then put things to bed in stoppage time, 2-0, by picking the pocket of Carrico and finishing well past Vaclik to put the finishing touches on Los Blancos’ second straight league victory.